Long beloved for their natural beauty and warmth, wood vanity tops create a look like no other, and they’re available in various types and stains. From maple to cherry to bamboo (which is technically a grass), you’ll find myriad options. If you go with reclaimed wood countertops, you’re also going with a recycled, eco-friendly option. On the downside, however, wood countertops can sustain water damage when they’re not sealed properly, and they may need to be refinished over time. Solid-surface materials like acrylic-resin create versatile, durable countertops that can, in some cases, rival the look of natural stone. They’re affordable, virtually seamless, impact-resistant and, in cases where they do sustain damage, easy to repair with a little buffing. Resin countertops are also nonporous, so they don’t encourage the growth of bacteria or fungus — a positive feature in the high-moisture environment of a bathroom. As far as downsides, acrylic-resin countertops can have a lack of consistency among products, so there’s not a lot of reliability from one version to another. Looking at these four popular bathroom vanity surfaces, it’s easy to see how there are strong benefits to each one. Whether you go for the durability of nonporous solid-surface countertops or the warmth and beauty of wood depends on several factors. Think about looks, for one thing, and the visual impact each countertop choice would have on your bathroom’s appearance and ambiance overall. Consider also durability and which countertops can best hold up to the level of use you’ll require in your home. 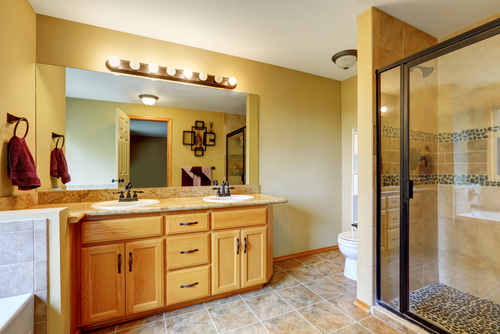 Last but not least, think carefully about costs, compare different price points, see what fits in your budget, and pick a vanity top that suits your needs.